The PMI Professional in Business Analysis (PMI-PBA)® is PMI’s fastest growing certification and with good reason. Business analysis in the context of projects and programs can be as much work inside a project as the work of managing the project itself. Not only does it consume a lot of resources, but requirements management, a component of business analysis, is often cited as the key indicator of project success or failure. The other reason this certification is enjoying growth is that it is a natural professional development step for PMs who do the work of business analysis on their projects, or BAs who do PM work. Those hybrid PM-BAs or BA-PMs make up a large group! After years of managing projects, I hadn’t really thought about the BA work I had been doing on projects. The PMI-PBA inspired me to take a closer look at the business analysis work that happens within the context of a project, and specifically as it is defined by the tasks in the Exam Content Outline. It was a perfect fit for me to formalize my practice and to better distinguish between the work I do as a PM and the work I do as a BA. As with any certification journey, the process was both a validation of what I’d done and an opportunity to recognize gaps and improve my PM and BA practice. Wherever your PBA journey begins, it will eventually end up with taking the PBA certification exam. I kept notes on what I did while preparing and my approach helped me pass on the first try. Of course, what works for me may not work for everyone, but below are the things I did to prepare for my PMI-PBA exam. I hope they work for you, too! Take the Watermark Learning PMI-PBA Certification Boot Camp. Whether taken as in-person, virtual, or Anytime Learning (which I did), the course will get you started in the right direction. A solid certification prep course like Watermark’s gets you oriented to the discipline properly and helps you wade through all the material and resources and be most efficient and strategic about how you approach the exam. Read the PMI Business Analysis for Practitioners: A Practice Guide. The PBA exam does not have a body of knowledge (BOK) as a reference like some exams such as the PMP or CBAP. However, the PMI BA Practice Guide is a key resource that you want to be familiar with. Read the Watermark Learning PBA Study Guide. The Watermark Learning PBA Study Guide complements the course materials and will reinforce what was covered in class. The Watermark course material, PMI BA Practice Guide, and Watermark Study Guide together provide a comprehensive suite of resources for preparing for the exam. Review the Boot Camp manual, PMI BA Practice Guide, and Watermark PBA Study Guide by domain using the Exam Content Outline (ECO) as a reference point. After going through the class and reading the PMI BA Practice Guide and Watermark PBA Study Guide, I reviewed the materials again per domain. That really helped me reconcile the different resources and get a sense for what was going on in each domain. Starting with the tasks in the ECO helped me understand what I am doing in each domain and then reading the materials put more substance around those tasks in terms of tools I might be using and how I might execute those tasks. In retrospect, taking a vertical approach to studying (that is, by domain) was key to internalizing what I needed to know about how to do BA work in each domain. Make flashcards throughout your study and preparation. I created hand-written flashcards using small recipe cards, but Watermark has a free template for creating your own flashcards online, as well. Don’t just memorize something – create something. I’ve found making my own flashcards to be much more interesting and helpful than memorizing manufactured flashcards. Identify what you are going to include on your brain dump. While studying, be thinking about your brain dump and sketch it out as you go. One thing I did was put a mark on my flashcards if it was something I thought I would want to include on my brain dump. I did not take any practice tests until I’d completed Steps 1-3. For me, I wanted to have my bearings around the exam content before taking a practice test. 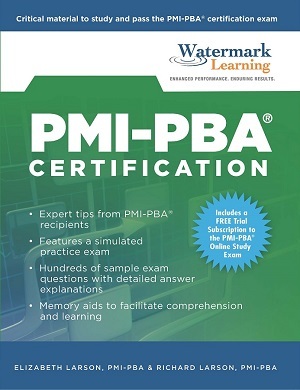 Watermark Learning offers a PMI-PBA Online Study Exam that has over 800 realistic questions, similar in tone and quality to the actual exam. Once I got into the flow of studying, then I took smaller tests periodically. I found frequent, shorter tests helped me digest the content in a different way and gave my brain a different way to work than just taking in information. Just prior to the exam, I started practicing my brain dump. I gathered all the things I marked that I wanted to include, culled through that to whittle down the amount I was going to include, and then figured out how I would lay it out on my brain dump page. Then I practiced writing it all down to be as quick as possible in order to take as little time as possible away from the allotted exam time. The day before my exam, I used the Boot Camp manual and did a practice presentation of the class. I pretended I was teaching the class and walked through the material at a high level to see if I could explain the concepts well enough to my pretend audience in order to be able to answer questions about them. It was a great way to catch a couple of things I wasn’t quite 100% sure about, but more importantly, it put me in a great mindset for the exam. It was a great confidence booster to hear myself talk about the material. Last thing I did was a final brain dump from memory. Interested in how Watermark Learning can help you on your journey? Contact us at info@watermarklearning.com. If Watermark Learning has helped you on your PMI-PBA journey, we would love to hear about it. Fill out our Feedback Form or contact us at info@watermarklearning.com. Great tips. Wish I had known them earlier…. but no regrets because I cleared in my first attempt nevertheless. Good points….esp 7. I went heavy on practise tests. Hi Gopal, thanks for the comment, and congratuations on passing the exam and receiving your PMI-PBA certification!